The Siri software is undoubtedly one of the main driving forces behind the huge global success of the iPhone 4S and plays a big role in convincing people to swap towards Apple when they are about to choose a new smartphone. Plenty of other voice recognition and assistant type applications exist, but nothing offers the same deep rooted functionality that Siri can provide, coupled together with the fact that the service is offered in a native setting and seamlessly works within iOS. No matter how good something is, it’s human nature to strive for improvements which is why we are the most technologically advanced generation and still developing at an astronomical rate. 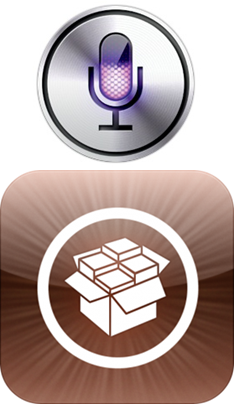 The developers behind the AssistantLove tweak which hit Cydia this week are clearly fans of Apple’s intelligent voice analysis software, but felt that it could do with some upgrades, which he was happy to provide. John Coates has implemented some features which we have already seen in some previously launch tweaks, but his software also features some unique integrations. AssistantLove provides the following feature set. Firstly, the modification for Siri features integration with the Spotify music streaming service which means users are no longer limited to instruct Siri to listen to music installed on their device, but can now force the playback of any track from within the Spotify library as long as the iOS application is installed on device. For music streaming to work through the iOS, Spotify users will need to have a premium Spotify account. Another great feature of AssistantLove is the GPS integration which is reason enough to use this tweak in my opinion. Out of the box AssistantLove supports the TomTom, Waze, MotionX-GPS and Navigon routing applications and means that when a user asks Siri for directions the relevant installed application will be launched with the route already mapped in using the device current location and the specified destination. The intelligent launching of applications is the third big feature of the AssistantLove tweak by John Coates. 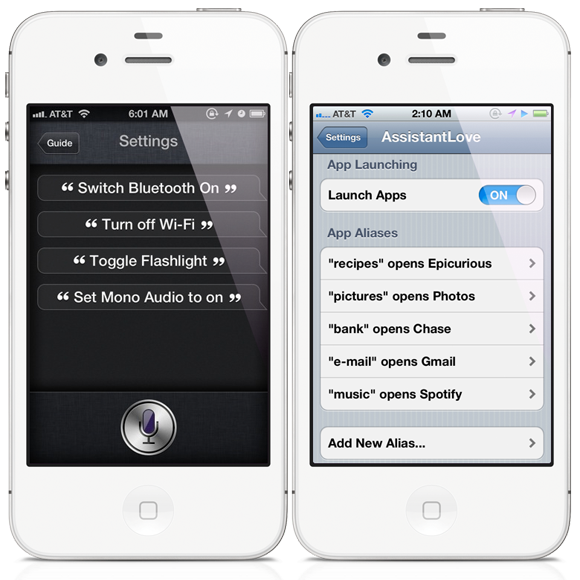 Other Siri tweaks allow applications to be launched by saying ‘Launch app [App Name]’ but AssistantLove handles this differently with an intelligent offering. The example cited in the release notes is the Battlefield 3 application, which users can now simply say ‘Launch Battlefield‘ and AssistantLove is clever enough to recognize what you mean and launches the required application. The app launcher side of the modification is two fold as it also allows aliases to be set for applications so instead of saying ‘Epicurious‘ users can now set an alias of ‘Recipes‘ which will force Siri to launch the application assigned to that alias. All options can be manually handled from within the dedicated preferences panel in the settings application and the developer has stated that he plans some powerful additions to the tweak in the coming months. He is also welcoming suggestions from his users as well as the community on the whole. AssistantLove can be downloaded from the Big Boss repository at a cost of $1.99 and requires a Siri capable device running iOS 5 or above.